Courtesy US Air Force/Justin Connaher. From rebuilding World Heritage sites to destressing the honeybee, drones offer new possibilities. There’s no question that the proliferation of drones in public spaces can range from the annoying to the dangerous. 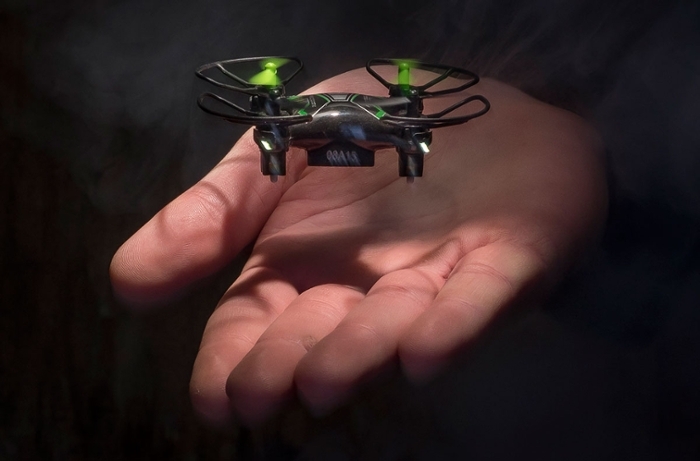 But scientists are also putting these remote-controlled fliers to a multitude of innovative uses meant to improve our lives and the world around us. Stretching across Northern China and southern Mongolia, China’s ancient defensive wall is one of the largest building-construction projects ever undertaken. The Jiankou section, 45 miles north of Beijing was constructed in the 14th century, and is one of the Wall’s steepest—and most picturesque—sections. Where there’s a wall, there’s a way. Drones survey and map crumbling sections of China's Great Wall, helping architects identify and prioritize rebuilding efforts for the 14th century heritage site. Courtesy BBC News. Covered in dense vegetation, the wall here clings to jagged cliffs, and many of the stairs are worn away. The unstable mountainous terrain makes it difficult for humans to inspect and repair the crumbling wall. But a new partnership between Intel and the China Foundation for Cultural Heritage Conversation is deploying drones to survey the wall and identify the sections most in need of restoration. The drones find faults and scan building patterns, and provide precise data to architects. But the restoration project is ultimately a combination of high and low tech. Donkeys carry building materials to the restoration sites and workers quarry replacement materials from nearby rocks, just as the original builders did. And if you get lost while exploring far-flung sections of the Great Wall, drones could help find and rescue you. In remote areas where the tree canopy is dense and GPS signals are unreliable, it can take a long time to locate a distressed hiker. How the lost are found. MIT and NASA scientists have developed an autonomous fleet of quadrotor drones that can search collaboratively for lost hikers using only onboard computation and wireless computation—no GPS required. Courtesy MIT. A team from MIT and NASA’s Langley Research Center have recently developed an autonomous system that deploys a fleet of quadcopter drones that search collaboratively. Relying only on on-board computation and wireless communication (no GPS needed), the drones use 2D LIDAR to create a 3D map of the relevant terrain. Algorithms help them recognize already-searched areas and retracing the flight path. A separate ground station integrates the maps from individual drones to make a composite 3D map that can be monitored by human rescuers. In a future implementation, the drones could be equipped with object detection to identify a missing hiker and flag that location on the map. Butterfly landmines are surface plastic landmines with low-pressure triggers. Due to the lack of metal components, these explosives are virtually invisible to metal detectors. Millions of these mines remain in post-conflict countries around the world. Their small design and sensitive trigger has led to a high casualty rate among children who encounter them while playing. Deadly butterfly. Butterfly landmines have little metallic content and so are difficult to detect—leading to the deaths of hundreds of children in post-conflict countries each year. Searching with infrared cameras mounted on drones can identify mines without endangering human operators. Courtesy Binghamton University. Researchers at Binghamton University have mounted infrared cameras on low-cost commercial drones to remotely map afflicted areas. In the early morning, mines heat more quickly than surrounding rocks and can be identified by their shape and thermal signature. They hope to develop a fully-autonomous multi-drone system that would allow for rapid wide-area assessment—without the need for a human operator to even get close to the minefield. Such a method would seriously reduce costs for mine-clearing operations. Doctors are often frustrated by the time it takes to deliver an organ from a donor and place it with a recipient. Every second of delay increases the likelihood the transplant will fail or the organ function poorly for its new owner. Faster delivery times means more lives saved. 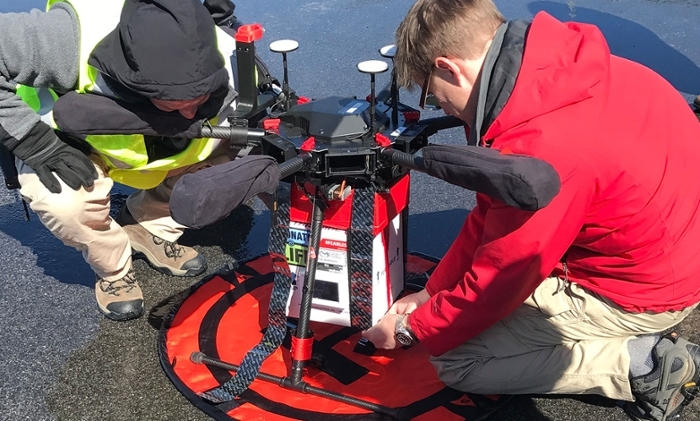 Dr. Joseph Scalea of the University of Maryland (UMD) Medical Center teamed up with UMD’s aerospace engineers to try out delivery by drone. They outfitted a six-rotor drone with a smart cooler that protected the organ from heat generated by the drone’s motors. A wireless biosensor tracked temperature, barometric pressure, altitude, vibration, and location during the flight. Using an experimental kidney not eligible for transplantation, they flew on a number of short-distance trial missions. The kidney’s temperature retained stable and was subject to fewer vibrations than when transported in a fixed wing plane. The next step would be to see if it could work over a longer distance—and whether FAA rules will allow it. The modern agricultural honeybee is overworked. They are trucked cross-country, fed synthetic diets, and exposed to pesticides in the fields. But what if they could get a little help from some insect-sized drones? Scientists in Japan have repurposed a sticky gel originally intended to be used as an electrical conductor. First tested on ants and houseflies, the gel was successful at attracting and distributing pollen. When the underside of a tiny drone is coated with horse hairs and this goldilocks gel, it’s just sticky enough to collect pollen from one flower and deposit on another. The horse hairs mimic the fuzzy belly of a bee and create more surface area for the pollen to adhere to. 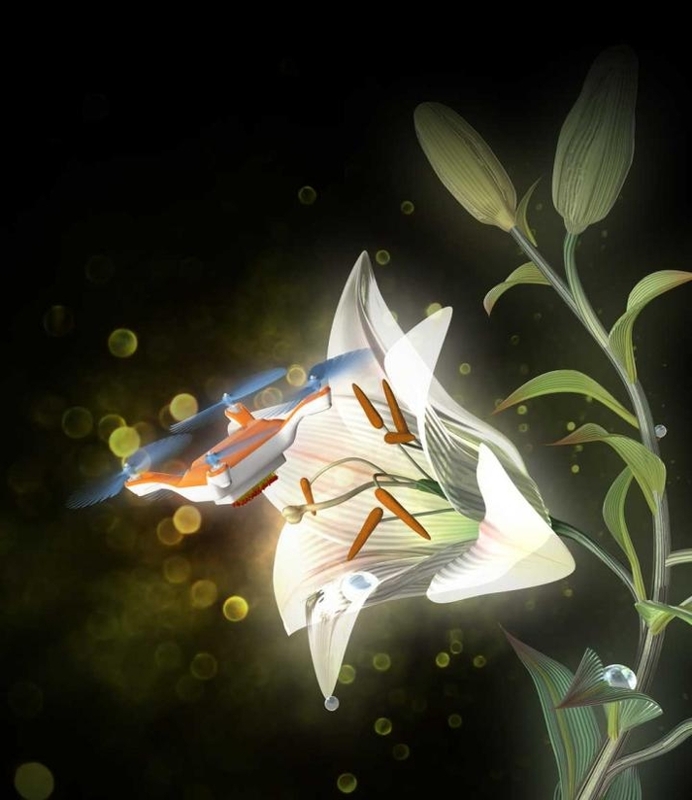 So far, the drones have successfully pollinated lilies. The inventors believe that, in the future, robotic pollinators could be trained to follow pollination paths using GPS and AI. The autonomous creatures wouldn’t replace honeybees—after all, they can’t make honey—but could reduce their workplace stress. What’s in a honeybee’s diet?